Wisdom comes from a heart full of compassion. It is the compassion that leads to kindness and giving. 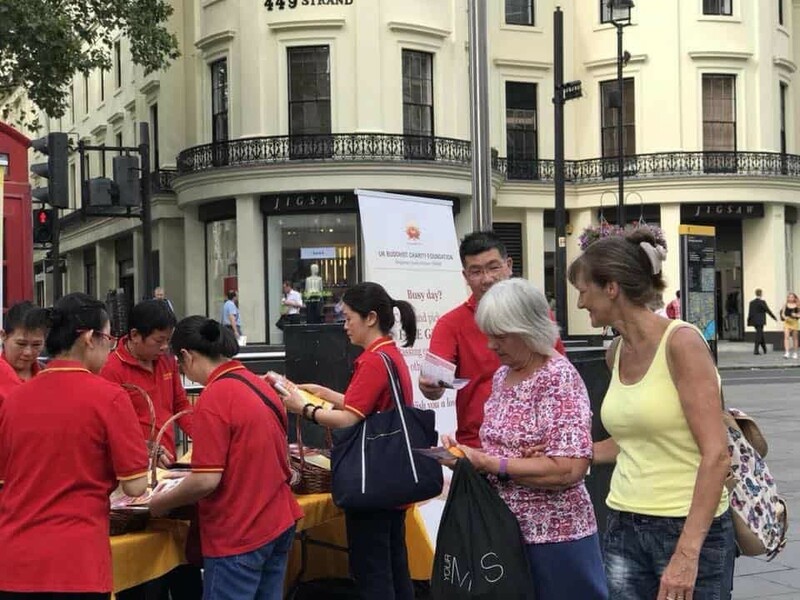 On August 7, 2018, around 4pm in the afternoon, volunteers from UK Guan Yin Citta Buddhist Charity Foundation organized a Free Fruit Giveaway activity at Charing Cross Station to transmit love and serve the community. The station is a central London railway terminal surrounded by Chinatown, Trafalgar Square and River Thames, acting as one of the busiest stations in UK to provide the majority of commuter and regional services to south-east London. During the rush hour, crowds were ebbing and flowing like a tide in this area. Many people are busily running for their lives, exhausted and tired. Like the breeze in summer, giving fruits to these metro riders can not only boost their energy, but also bring them a sense of freshness and relaxation. 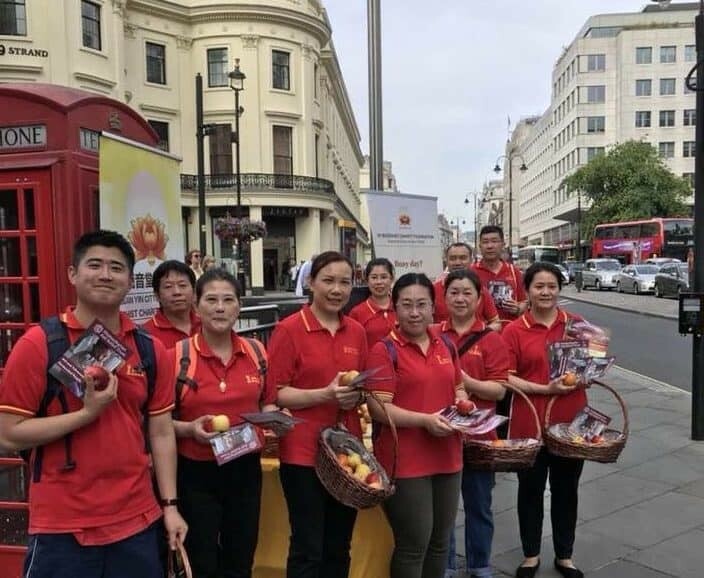 All the volunteers from UK Guan Yin Citta were uniformly in the vibrant red color Polo T-shirts, passing out apples and oranges to the crowd with smiles. The fresh fruits attracted many people’s attentions and made it’s easier to build a conversation between volunteers and pedestrians. Many people received fruits expressed their gratitude to volunteers and UK Guan Yin Citta for their amazing kindness and selfless giving. During the period of 45 minutes propagation, there were 230 apples distributed for free and quite a number of flyers handed out. 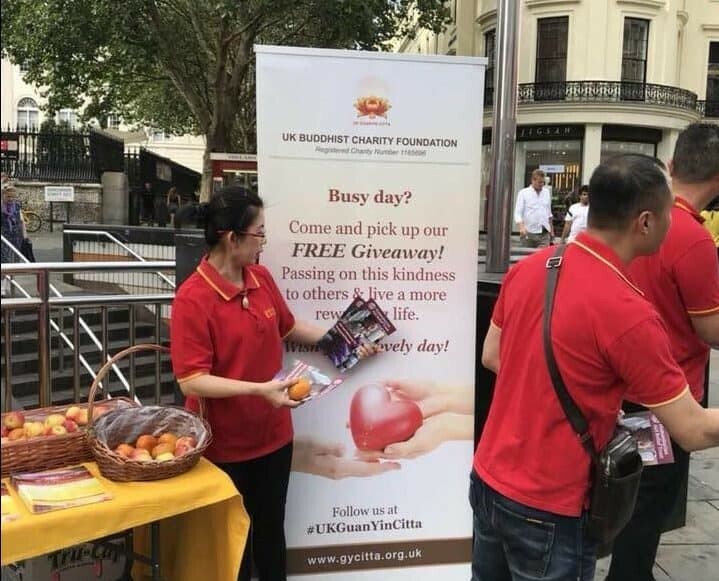 As a charity registered under the UK charity association, UK Guan Yin Citta has been committed to improving community harmony and promoting Buddhism. The Free Fruit Giveaway is just one of the good attempts to transmit compassion and love through the practice of selflessness and giving. These virtues are vigorously advocated by Buddhist Master Jun Hong Lu in his public talks and books. 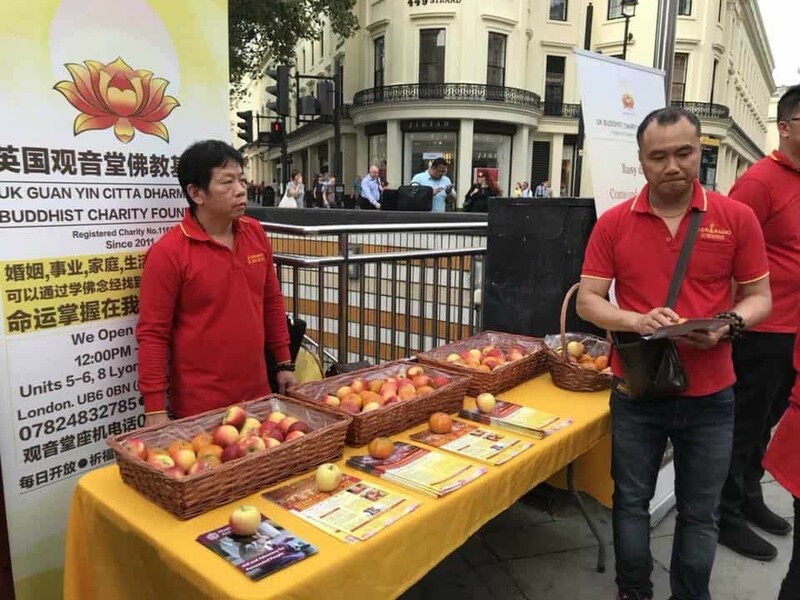 Moreover, UK Guan Yin Citta has been constantly promoting vegetarianism by regularly holding free vegetarian events in the communities. In spite of the fact that volunteers’ good deeds may seem small, their ripple effects are essentially far-reaching and lasting. Master Jun Hong Lu has been emphasizing the Buddha’s teaching that “Cultivate all good, avoid all evils, and to purify one’s mind”. With the residence of loving kindness, compassion, joy and equanimity in every action and intention, the liberated state of mind and supreme bliss are not unattainable.